Bombus, based near Faversham was created back in 2002. 'Amelia Coward, our founder, started the business from her kitchen table' explains marketing manager, Becky Smith. The 'eureka moment' came when she stumbled across a box of old maps at a flea market and was drawn to the patterns, textures and colours, not dissimilar to the fabric she was more used to working with. 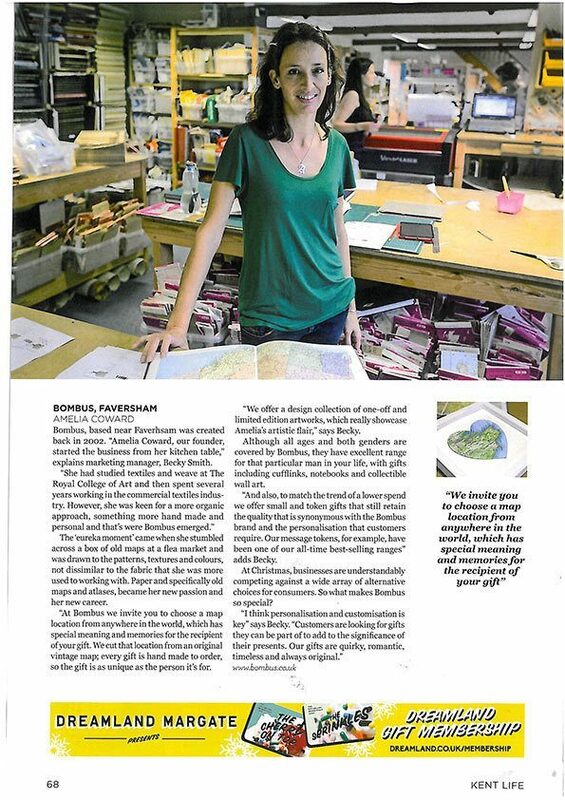 Paper and specifically old maps and atlases, became her new passion and her new career. 'At Bombus we invite you to choose a map location from anywhere in the world, which has special meaning and memories for the recipient of your gift. We cut that location from an original vintage map; every gift is hand made to order, so the gift is as unique as the person it's for. 'We offer a design collection of one-off and limited edition artworks, which really showcase Amelia's artistic flair,' says Becky. Although all ages and both genders are covered by Bombus, they have an excellent range for that particular man in your life, wit gifts including cufflinks, notebooks and collectible wall art. 'And also, to match the trend of a lower spend we offer small and token gifts that still retain the quality that is synonymous with the Bombus brand and the personalisation that customers require. Our message tokens, for example, have been one of our all-time best-selling ranges' adds Becky. At Christmas, businesses are understandably competing against a wide array of alternative choices for consumers. So what makes Bombus so special?